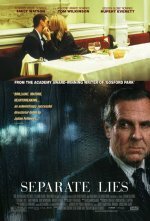 Separate Lies release date was Friday, September 16, 2005. The directorial debut of Oscar-winning screenwriter Julian Fellowes, who also penned the script, features characters played by Emily Watson, Tom Wilkinson and Rupert Everett trapped in a moral maze with no exit in sight. Anne and James (Watson and Wilkinson) seemingly have an ideal marriage until the arrival of Bill (Everett) and a tragic accident in their idyllic country village threaten to unravel their lives forever.